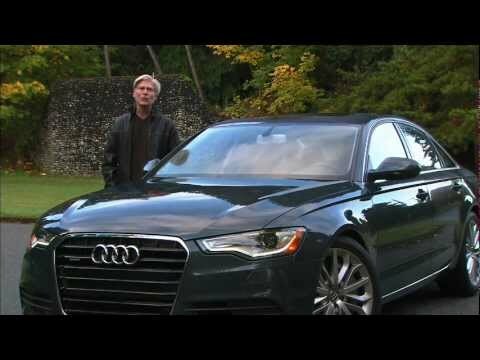 The A6, all new for 2012, stands out in the midsize luxury sedan segment with a wealth of technology and design features. On the road, it compromises well between comfort and performance, with an available supercharged V6 for those seeking a heavier dose of the latter. I love my car - an Audi a6. Have had absolutely no problems with this car. Totally reliable. Extremely comfortable and with all the great performance aspects you'd expect from Audi. I take it to the Audi dealer once a year and they perform maintenance and look for any potential problems. Audi keeps great records on their cars so well worth checking in with the dealer once a year. Bottom line - I love this car! The built in map is the best I have seen even out of high end luxury cars. I love this car, drives smooth and quiet. Never had a major mechanical problem and goes great in the snow. There is enormous space in the trunk and the back seat go down for even more room or trunk access. The one problem I do have is that the sound system did go out and must replace the entire panel to get it back. Sometimes my car would die and I'd get stuck in the middle of the road. I love my car so much it is amazing. Sometimes I have problem with the breaks but it is an easy fix! I have about 4500 miles on my car. This car is the best car I have had. This car is great on gas I spend about 45$ to fill my tank. Lasts me about a week and a half going to work and school. Volkswagen Group of America, Inc. (Volkswagen) is recalling certain model year 2012-2013 Audi A6 and Audi A7 vehicles. The affected vehicles have a fuel hose in the engine compartment that may degrade and leak fuel. A fuel leak in the presence of an ignition source increases the risk of a fire. Audi will notify owners, and dealers will replace the under hood fuel pump and fuel hose, free of charge. The recall began November 2016. Owners may contact Audi customer service at 1-800-253-2834. Volkswagen's number for this recall is 24BZ. VOLKSWAGEN IS RECALLING CERTAIN MODEL 2012 AUDI A6 VEHICLES MANUFACTURED FROM APRIL 8, 2011, THROUGH MAY 26, 2011. DUE TO A PROBLEM IN THE STITCHING PROCESS OF THE CURTAIN AIR BAG, THE SEAM OF THE AIR BAG MAY NOT BE STITCHED PROPERLY. IN THE EVENT OF A CRASH, THE HEAD CURTAIN AIR BAG MAY NOT DEPLOY AND WILL NOT BE ABLE TO PROPERLY PROTECT AN OCCUPANT, INCREASING THE RISK OF AN INJURY. VOLKSWAGEN WILL NOTIFY ALL OWNERS AND DEALERS WILL REPLACE THE LEFT AND/OR RIGHT CURTAIN AIR BAG FREE OF CHARGE. THE SAFETY RECALL IS EXPECTED TO BEGIN DURING JANUARY 2012. OWNERS MAY CONTACT VOLKSWAGEN AT 1-800-822-8987. Volkswagen Group of America, Inc. (Volkswagen) is recalling certain 2012-2014 Audi A6 and A7 vehicles. The fuel line has a compression point that can weaken, potentially resulting in a fuel leak. A fuel leak in the presence of an ignition source, increases the risk of a fire. Audi will notify owners, and dealers will replace the fuel line, free of charge. The recall is expected to begin February 5, 2018. Owners may contact Audi customer service at 1-888-237-2834. Volkswagen's number for this recall is 20AR. Volkswagen Group of America, Inc. (Volkswagen) is recalling certain model year 2012-2013 Audi A6 vehicles manufactured March 28, 2011, to March 25, 2013, and 2012-2013 Audi A7 vehicles manufactured January 25, 2011, to March 19, 2013. In vehicles with heated and cooled seats, the Passenger Occupant Detection System (PODS), used to enable the front passenger air bags, may malfunction and prevent the passenger-side air bags from deploying in a crash. An air bag that does not deploy as intended increases the risk of occupant injury in a crash. Volkswagen will notify owners, and Audi dealers will install a PODS system repair kit, free of charge. The recall began on February 5, 2016. Owners may contact Audi customer service at 1-800-253-2834. Volkswagen's number for this recall is 74D1. Volkswagen Group of America, Inc. (Volkswagen) is recalling certain 2013-2017 Audi A5 Cabriolet, A5 Sedan and Audi Q5 vehicles, 2012-2015 Audi A6 vehicles and 2013-2016 Audi A4 Sedan and A4 allroad vehicles. These vehicles, equipped with 2.0l Turbo FSI engines, have an electric coolant pump that can either become blocked with debris from the cooling system causing it to overheat or can short-circuit from moisture within the pump. A blocked pump or a short-circuited pump can increase the risk of a fire. Audi will notify owners, and dealers will replace the pumps, free of charge. Parts are not currently available. Owners will be sent an initial notification beginning on June 11, 2018. A second notice will be mailed once remedy parts become available. Owners may contact Audi customer service at 1-800-253-2834. Audi's number's for this recall is 19N3/19N4. Note: This recall is in additional to the coolant pump software update applied as a remedy under recall 17V002.